This week, we wanted to share some more tips on how we decorated, and give you the overall details of the brunch. 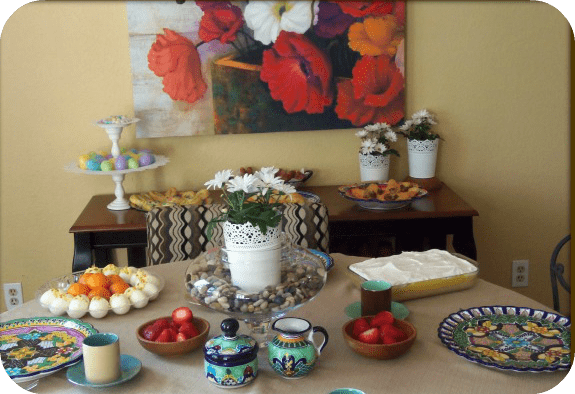 We were practical at this brunch, and used food for most of the decorations. There was a kids table with fishy crackers put into cellophane bags in the shape of carrots (picked up at Walmart for $.89!). 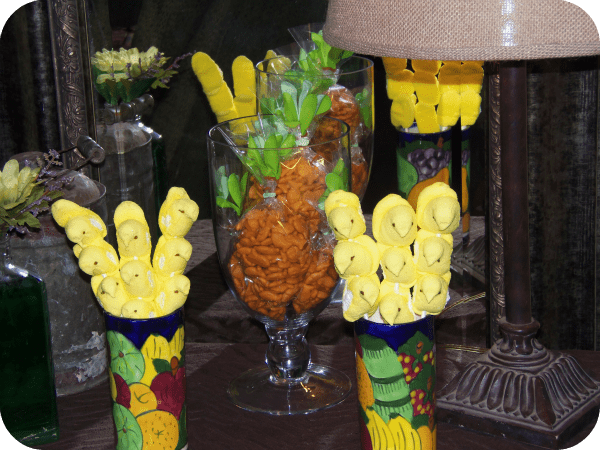 We also made peeps bouquets, by stacking them on skewers. The kids asked me to keep this table stocked all day! The night before, I set out my favorite espresso cups, and picked up a couple of white pot holders for $3.99 at Ikea, and added a $1.50 plant in each one. I also stacked two different size trays in the same white pattern on two white candle sticks from Ikea. There are jelly beans on the top tray and nuts and candies in the eggs on the bottom tray. I used a putty to hold them together temporarily, so I can then reuse them in my girls room for decor after our brunch! The adults got caramel lattes when they woke up (we had the grandparents over), and the kids got steamers (warm milk with caramel or vanilla). Many of the neighborhood kids come to my house for these drinks – it’s a great way to treat the neighbors on a budget. Bunny Shaped Cinnamon Rolls – Used Great Value Cinnamon Rolls. Use one for the face, and unroll one to create the ears on top. Add mini chocolate chips for the eyes, and nose – and cut up gummy candies for the whiskers. Little Chick Deviled Eggs – Make your favorite deviled egg recipe, only instead of cutting them length wise, cut the top 1/3 off the egg and scoop out the yolk. Once you have made your deviled egg mixture, fill the bottom half of the egg and top with the top of the egg. Add small pieces of pickles or olives for the eyes, and a carrot for the nose! Bacon Wrapped Sausage – wrap one uncooked sausage link with one piece of uncooked bacon. Put on a cookie tray, and bake at 350 for 25 minutes, or until bacon and sausage are cooked through. Espresso – If you don’t have a machine, find out how to make lattes, mochas and more without an espresso machine! Make sure to check out all of our recipes using Great Value products including Salted Caramel Bars, Mini Caramel Apple Pie Tarts, Individual Chicken Pot Pies, Sugar Cookie Fruit Pizza and Fruit Filled Nutella Mini Pies. You can also check out Twitter and use the hashtag #GreatValue to see more unique recipes using Great Value refrigerated dough products to create yummy Easter recipes! Disclosure: This post is part of a campaign sponsored by Great Value and the Motherhood. All opinions are mine. You can find Great Value products at Walmart.